Ford Mustang watches just might be the next best thing to owning a classic Mustang. A top quality Mustang watch is a great investment. You can wear it anywhere. It looks great and makes a great gift! Check out the great selection of styles below. 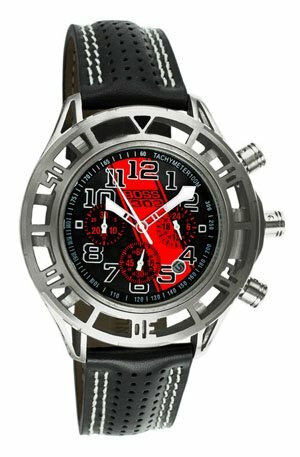 These officially licensed, Mustang logo watches are affordable and feature quartz movements for accurate timekeeping. And a collectible tin, is included with many of these timepieces. 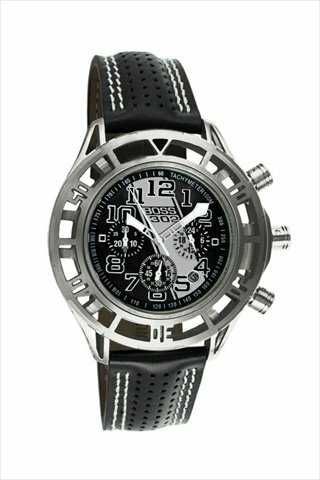 This Ford Mustang Boss 302 Mens Watch features 3 unique time setting pistons and a beautiful white stitched black wrist strap, resembling the real Boss 302's high quality seat stitching. With it's high quality quartz movement, 316L surgical steel gears, hardened non glare crystals. Like the iconic Rolex, with it's screw-in stems and case back, your watch not only assures accurate timekeeping and long lasting great looks but water resistance to an incredible 100 meters. Prefer your pony car in silver? This silver face version Boss 302 Watch features a silver and black logo metal face, complemented by the same beautiful white stitched black leather wristband and 100 meter water resistance. 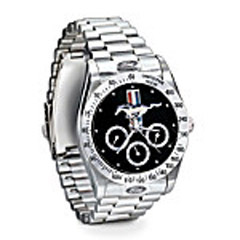 Here's a high quality Ford Mustang Engraved Chronograph. With a gleaming stainless steel case and band, his beautifully crafted tachometer style watch, speaks quality. A great tribute to a legendary car.